My Review: I read this book in the last couple days. It got off to a bit of a slow start, but then started going pretty good. This is one of those stories that just kind of drops a character in your lap and you find out the story from where they are with some comments and memories that help flesh out the story. I'm not always a fan of this device in storytelling, but with this story it works well. It adds to the mystery of the story and the storm. 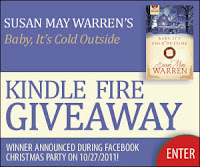 Contest: Warm up to Christmas early this year with Susan May Warren's Baby, It's Cold Outside! To celebrate the release of her new Christmas book with Summerside Press, she and the publisher are giving away a Kindle Fire and hosting an early Christmas Party on Facebook! Read what all the reviewers are saying here. Enter today by clicking this link. Giveaway ends on 10/26! But, wait there’s more! 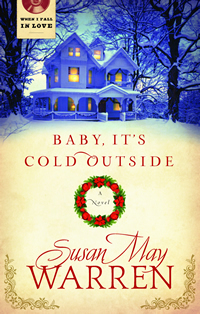 Join Susan May Warren on 10/27 for merriment and a few early Christmas presents at her Baby, It's Cold Outside Christmas party! Grab your Christmas sweaters, socks and pj’s and join Susan and a few friends for a fireside chat about her recent books (Heiress & Baby, It’s Cold Outside), holiday traditions, favorite Christmas recipes, a trivia contest and more! Invite your friends and don’t miss the fun! RSVP here and we'll see you on October 27th at 5 PM PST / 8 PM EST! 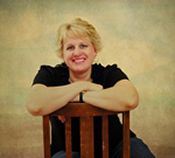 Susan May Warren is an award-winning, best-selling author of over twenty-five novels, many of which have won the Inspirational Readers Choice Award, the ACFW Book of the Year award, the Rita Award, and have been Christy finalists. After serving as a missionary for eight years in Russia, Susan returned home to a small town on Minnesota’s beautiful Lake Superior shore where she, her four children, and her husband are active in their local church. Susan's larger than life characters and layered plots have won her acclaim with readers and reviewers alike. A seasoned women’s events and retreats speaker, she’s a popular writing teacher at conferences around the nation and the author of the beginning writer’s workbook: From the Inside-Out: discover, create and publish the novel in you!. She is also the founder of www.MyBookTherapy.com, a story-crafting service that helps authors discover their voice.